Iya Sako "A Djembe Master from Samakofadda in the Wassalon region of North East Guinea, Iya Sako, is from the Malinke tribe. Iya started to play with the village djembe fola when he was nine, then became a djembe fola himself, and was in great demand as a performer. 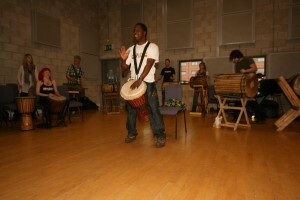 Iya subsequently worked throughout Guinea and Mali, and has played in many groups, including Hamana Diada and Fankabah, moving to the UK in 2007 and now living in the North West. He continues to teach and perform internationally."